Here's an astonishing fact: a crack in a pipe that's no more than three millimeters can release some 250 gallons of water every day. Let's say you're back home to Colorado after a weeklong sunny winter vacation. Now imagine you come home to a flooded house! There have been no reports of flash flooding from your neighbors. Of course, you know. Frozen pipes are one of the most common reasons for water leakage within the home. If such a small leak could cause that much running water to leak in a day, you don't even want to think about what could happen in two weeks. What are some ways to prevent frozen pipes from ruining the perfect vacation? First of all, insulate the pipes around crawl spaces and your attic. Exposed pipes are the most likely to freeze, and the more insulation you use, the better off you'll be. Heat tape can also be used to wrap exposed wire. Additionally, it's a good idea to seal any leaks that might allow cold air inside. Air leaks are sometimes found around electrical wiring, pipes and vents. A helpful tip, especially for businesses, is to first, disconnect any garden hoses, and then use an indoor valve to shut off the water during freezing conditions. 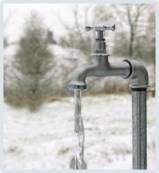 It is also important to drain the pipes leading to outside faucets completely so that no internal freezing occurs. If you are planning on a lengthy vacation, then there are a couple of options to consider. Many people may choose to completely turn off and drain their water system until they get back. This does ensure that no home flooding occurs from leaks or plumbing problems. But one disadvantage is that this will also turn off any sprinkler systems installed for fire safety. This is why other people will choose the second option, which is to set the thermostat at medium length, no lower than 55 degrees Fahrenheit, and ask a friend to come watch the house. Many homeowners today easily forget about freezing pipes. You can't really blame them with all the other stress people deal with in life. But once they come home to a flooded house, they quickly remember the freezing pipes. Remember these tips to avert a water disaster.